Higher click-through rate, but is it ethical? Purch—the online tech and science publisher of sites like Live Science, Top 10 Reviews and Space.com— will allow brands to buy native ad pages that also contain editorial reviews, further blurring the line between advertising and editorial. The new offering, called the Purch Performance Package, will allow companies to sponsor pages that contain editorial reviews of their products. The company said reviews will remain objective, but all the links to additional content and other advertising will be hand-selected by the marketer. Purch's sites are viewed by more than 78 million people monthly. In test rollouts on Top 10 Reviews, mixing the two types of content has lead to a 10 to 20 percent click-through rate on ads on sponsored pages, according to Purch CRO Mike Kisseberth. The industry average for banner ads hovers between 0.2 and 0.5 percent. "It's a cleaner experience for the user. They get the content they are looking for, and the promotional content featured is much more related to the thing they were seeking out so the connection rate is very, very high," he explained. The customizable content will be rolled out to all of Purch's publications that feature tech reviews, including Tom's Guide and Tom's Hardware affiliated pages. In the future, Kisseberth said it's not unlikely that it'll allow the offering on any of its content pages, such as a Live Science page on diabetes. "We could optimize these pages to channel interest in that category so they can reach the performance goal that the brand seeks," he said. The concept of selling links inside editorial pieces isn't unique to Purch. The New York Times used to offer Ricochet, which allowed brands to buy advertising around a specific editorial piece of their choosing for a certain period of time. 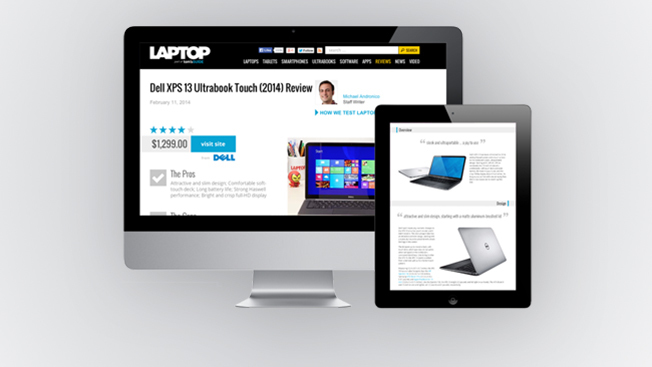 CNET Replay allows brands to promote positive reviews of their products on CNET's homepage. Companies like inPowered allow marketers to search through its platform for editorial articles written about their products or brands, so they can seed those stories on social media or pay inPowered to place selected pieces in native advertising. Altimeter Group analyst Rebecca Lieb said authoritative, third-party content is known to be more compelling to consumers than anything an agency could come up with, and it's making ecommerce sites more important. "Purch Performance Package is basically another form of converged media, and we're seeing more and more forms of converged media where they're taking earned media and popping it in an ad unit," Lieb added. However, some have brought up the ethical concern that native advertising may encourage positive reviews of certain products in order to boost ad sales. To combat those fears, Kisseberth said the Purch Performance Package will only be offered for items the editorial staff has independently given a positive review. "If it's a crummy product, there wouldn't be a lot of interest in the marketplace for it anyway," he pointed out. "Plus, we will continue to monetize all the pages we have with traditional methods, as well as the Performance Package." But, Gartner vp distinguished analyst Andrew Frank said filtering out positive reviews is akin to having brands solicit endorsements. Pressure to turn a profit could squeeze editorial staff members into pushing positive content, and consumers may also confuse advertising for editorial content if it isn't clearly delineated. "We're reaching a new kind of slippery terrain in this particular case," he warned.